Native drums beat an eerie rhythm through the darkness of the jungle. 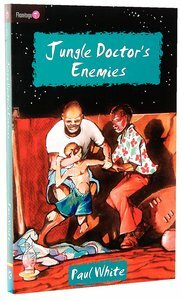 The blind boy Mubofu had been secretly bringing children from hostile Chief Chikoti's village to the hopsital for treatment - but now the boy has mysteriously disappeared. Is this part of Chikoti's evil attack against the Doctor and his medicine? Will the Jungle Doctor prevail against the power of witchcraft? Another thrilling adventure from Paul White based in Myumi Hospital, Tanzania. About "Jungle Doctor's Enemies (#005 in Jungle Doctor Flamingo Fiction Series)"
The classic Jungle Doctor books have been made available to a new generation with these great value reprints. Kids aged 8-12 will love following the adventures of a missionary doctor as he faces the challenges of life in East Africa. Great storytelling, full of gospel truth!